I had fennel to use up. My preferred method is to chop finely with onion in a food processor, and then sauté in olive oil until caramelized and sweet… mmm, yummy! But when I saw I had about 15 minutes until Shabbat came in (at which point I need to stop cooking, preferably a bit before) I simply couldn’t use that option. What to do? I chopped the fennel, put in a pyrex with olive oil, and microwaved on high for 3 minutes. Checked the taste (I wanted it to be a bit sweet, still), and cooked for two more minutes. Then I added some salt, and the stroke of genius – balsamic vinegar. Another minute in the microwave, and voilà! Side dish done! I’ve found how satisfying a simple lettuce salad can be. 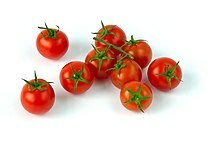 I rip a few leaves of lettuce with my hands, add some halved cherry tomatoes, and that’s it. If the mood strikes me (and if my hunger allows me to spend a few more minutes) I add sliced red pepper, sliced cucumber, or fresh mushrooms. However, the piece de resistance from my point of view is the honey mustard salad dressing. I make a small amount in an old jam jar. It keeps for 3-4 salads, easy. And it’s so much tastier to make it myself. Place all ingredients together in a jar with an airtight lid. Shake it until mixed. Taste and add ingredients to your liking. As part of the renovations, my husband realized one of his dreams, took over a balcony and bought a Weber gas grill. My husband loves BBQs, and loves inviting friends and family over for them. For me it’s even better, as I need to do minimal prepping of the vegetables and then I sit on the sofa looking pretty until the food is ready 🙂 Great for the last months of pregnancy! My husband does the entire meal on the grill – meat (steaks/chicken breast/kebabs/sausages), potatoes, vegetables (squash, fennel, red pepper, cherry tomatoes, onion, celery, kohlrabi). The grill is big, so it doesn’t take much time. And everything tastes awesome! Steaks/Chicken breast: He puts salt and freshly ground pepper on the steaks, and salt and paprika on chicken breasts. The children love chicken breast on the grill as is, so we don’t even bother with a marinade. Kebabs/hamburgers: we just use my basic meatball recipe: 1 Kg ground meat, 1 egg, 3-4 tbsp breadcrumbs, 1 tbsp mustard. Comes out tasty and succulent. Vegetables: a bit of olive oil and salt, one can also add paprika, thyme, rosemary, oregano, basil, etc. I also tried a marinade of soy sauce, balsamic vinegar, sugar, olive oil and garlic and it also came out very nice. 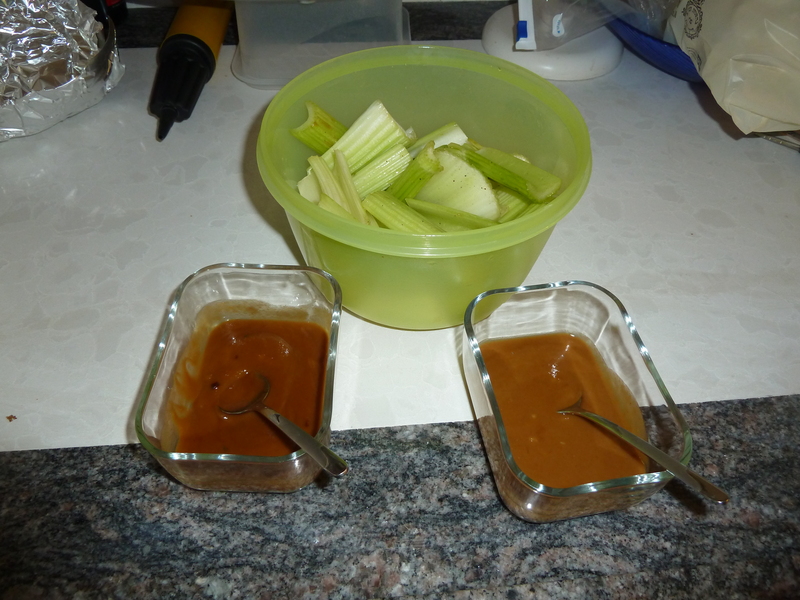 The challenge actually came when we had a whole lot of celery to use up. Out of curiosity I Googled “grilled celery”. To my surprise, I found a few recipes. What intrigued me most was when I found a recipe for peanut sauce. I tried it out, and dipped the grilled vegetables (including the celery 🙂 ) into the sauce and it made the grilled vegeatables even more awesome! Mix the peanut butter with the chicken broth. Heat in microwave for 30 seconds to make it easier. Add other ingredients and heat for 30 seconds and mix. continue in 30 second stages until the mixture is smooth and is of a dipping consistency (the more you heat it, the denser and less liquid it’s going to be). Use for grilled or fresh veggies and meat. 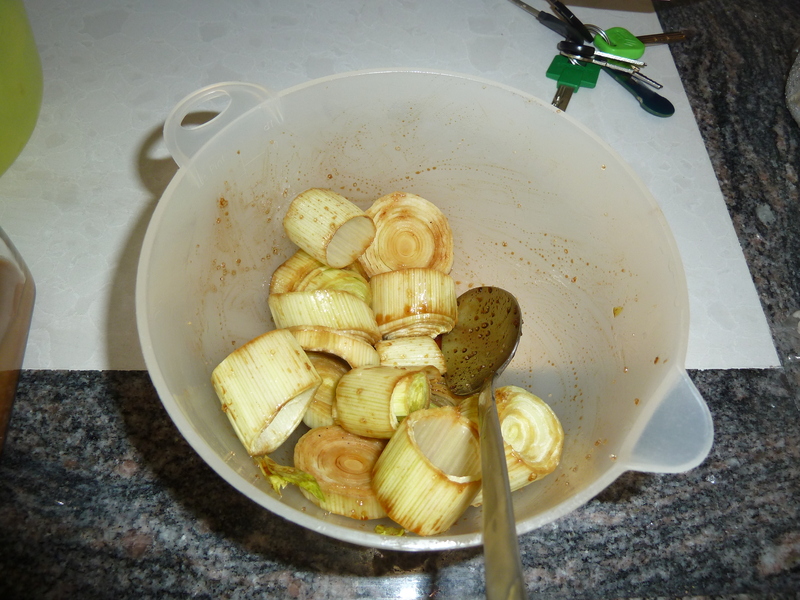 In the picture, the celery is pre-grill, with only olive oil, salt and pepper. After grilling it came out tender yet still crunchy. The left hand sauce is the spicy one, the right hand one is the regular. I cooked the spicy one a bit more, which accounts for the change in colour and consistency. Last week I went to a cooking workshop with a friend. We made six dishes: whole wheat pita (amazing!! ), whole basmati rice with spices and fava beans (ful in hebrew and arabic) (amazing!! 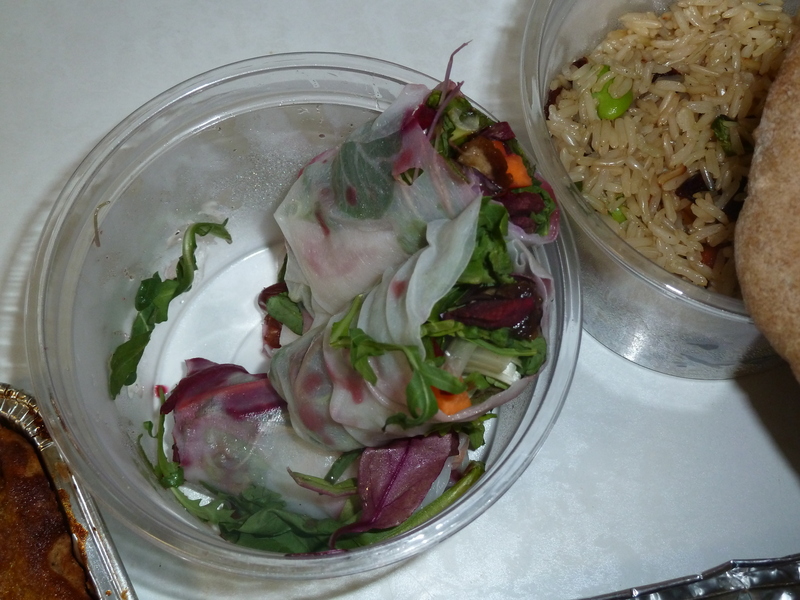 ), fresh vegetables and dates in rice paper (amazing!! 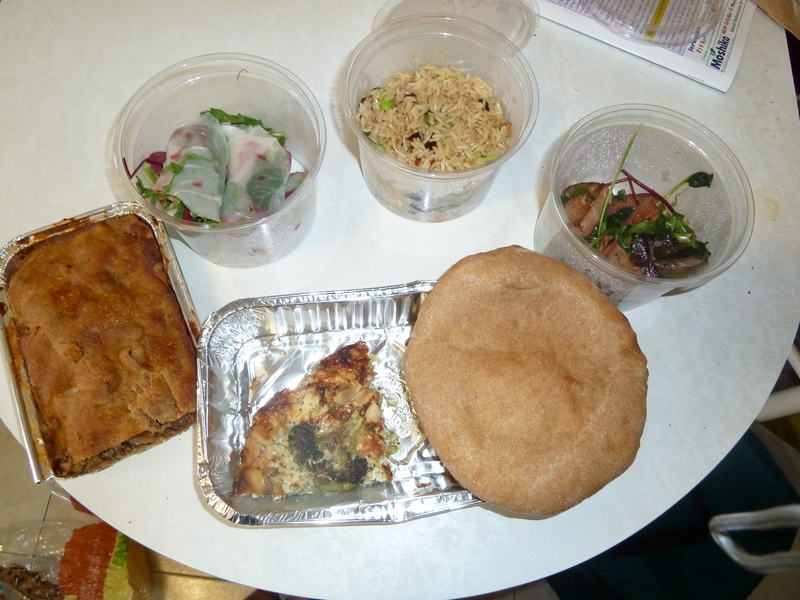 ), apple pie without sugar (OK, but full of butter), broccoli quiche (OK, but nothing special except for learning how to use real nutmeg instead of the ground stuff you have in the supermarket) and fried marinated tofu (OK, but tofu is not my thing). What I like about cooking workshops is the new ingredients. Whole nutmeg; Whole cardamom pods; dried chilli peppers; rice paper; fava beans. These are things that I never tried using, and now they would be part of my kitchen. I’m definitely going to try doing the amazing dishes at home, but I started with the rice paper. A friend of mine recently gave birth and I wanted to invite her, and I asked her to tell me when they’ll be in the neighborhood (her father lives close to us). Friday an hour before Shabbat I received an SMS from her – they were in the neighborhood for Shabbat, perhaps they could drop by in the afternoon? I said sure! And then I realized that my cake would probably be gone by the afternoon, and I didn’t have the time or patience to bake something additional. 1. Buy rice paper (I used 22 cm diameter, there are smaller). 2. Cut up everything you want to put inside and place it within reach. 3. Prepare a large pie dish that can hold the rice paper without folding. Put roughly half boiling water and half tap water. The water should be hot but cool enough to put your fingers in. 4. Spread a clean kitchen towel next to the pie dish. 5. Soak one rice paper in the water for 30 seconds. 6. Take out and spread on the towel. 9. Roll the bottom half, trying to keep it as tight as possible. 10. Continue rolling over the top half. 11. Slice in two diagonally and place in serving dish. 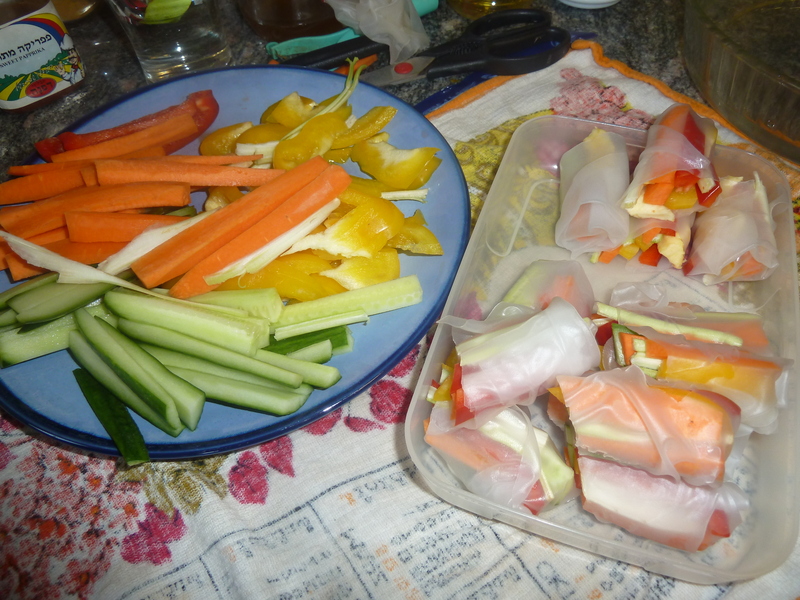 So I cut up our regular vegetables: carrot, cucumber, red pepper, yellow pepper, celery. 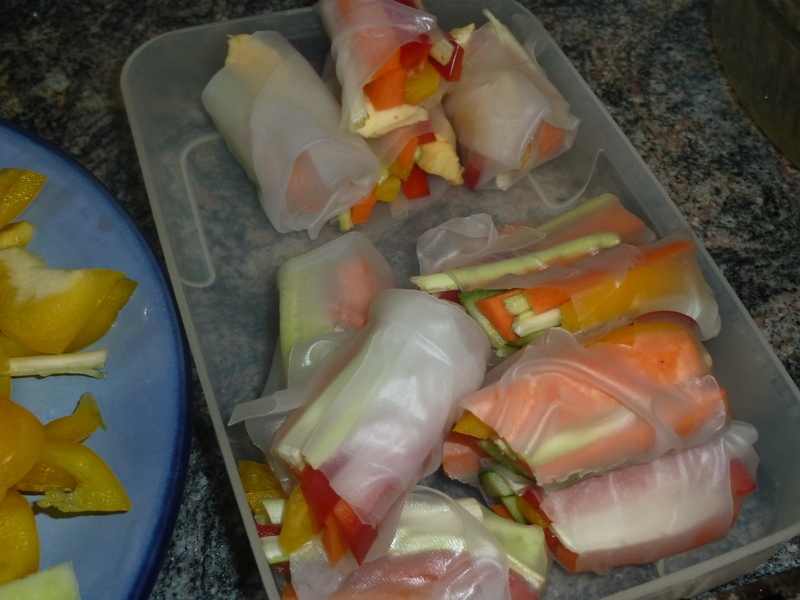 I prepared for the kids with the vegetables they like: carrot and cucumber for the youngest, carrot, bell pepper and celery for my eldest; I added to the kids’ rice rolls also some dried apple (our dates spoiled, otherwise I would have added dates). For the grown-ups, I just put a bit of every vegetable. I served it with a recipe from my mother’s korean cookbook, for dipping fried vegetable patties in: 1 tbsp sugar, 1 tbsp vinegar (I used balsamic) and 3 tbsp soy sauce, mixed well and left to stand a bit until the sugar dissolves. It was absolutely fabulous! In the end my guests arrived late (of course, as they were about to leave the baby decided she wanted to eat) so they missed it, but that turned out great as we ate them all! 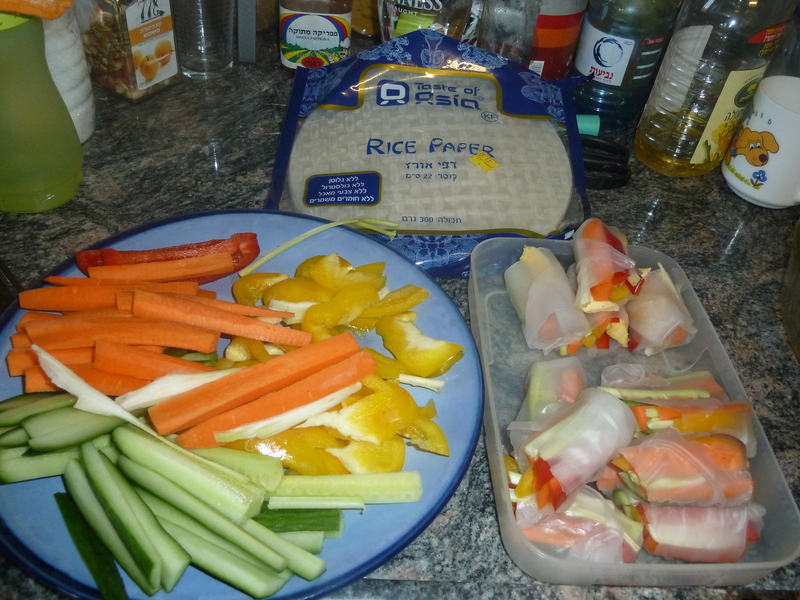 My eldest loved the rolls, my youngest picked out the vegetables and gave the rice paper back. And my husband and I wolfed them down. Shavua Tov (Have a nice week)! I really felt like a good exotic rich soup. Unfortunately, I cannot really make a soup like this, because my husband likes chicken soup, vegetable soup and tomato soup. In extreme situations he is willing to eat onion soup, but that is as far as it gets. My kids like chicken soup only, and even then only their grandparent’s chicken soup, never mine. So the solution was simple: We invited people to dinner for Shabbat, and that way I had an excuse to make an interesting soup. I regularly get the food magazine “Derech HaOchel” (The food road/way, very loosely translated), and they had seven soups of different colors, ranging from green split pea and mint soup to black bean soup. 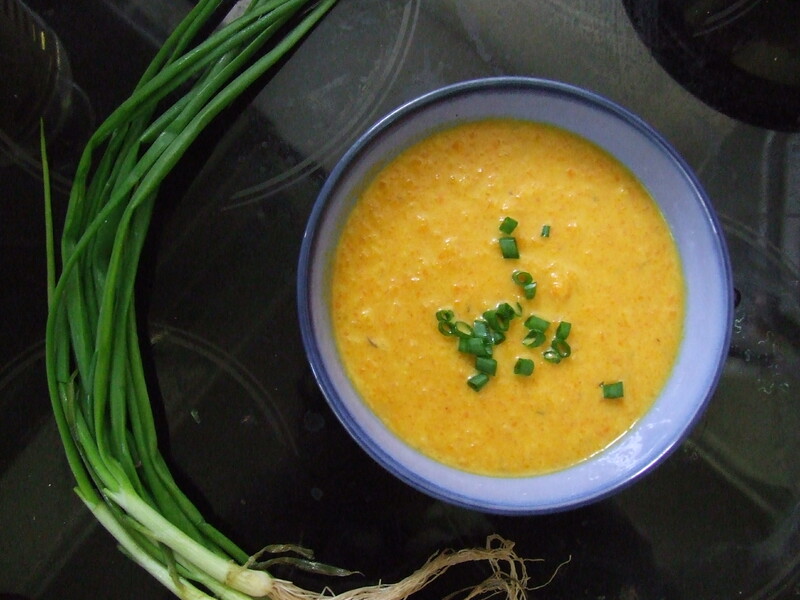 I thought of making the white soup (cauliflower) but in the end went for the orange soup (pumpkin-carrot-coconut). I really liked the idea of coconut, as it makes the soup creamy without making it dairy. Also, I hoped there was a chance my eldest would at least taste it (he loves coconut). I am almost embarrased to admit it, but though I’ve been cooking for more than ten years I have never made what is known in Israel as “orange soup”. I like it, and I ate it, and I know what is usually in it: pumpkin, carrot, sweet potato, onion. But I never made it. So: If not now, when? Fry the onion and garlic in the olive oil until transparent. Add the carrot, and fry for another 3 minutes. Add the pumpkin and fry for for another five minutes, stirring occasionally. Add the tea , water, thyme and curry (if using) and cook until the vegetables are soft. Taste occasionally, but don’t worry if the taste of thyme is very strong as it gets milder during the cooking. Add the coconut milk. 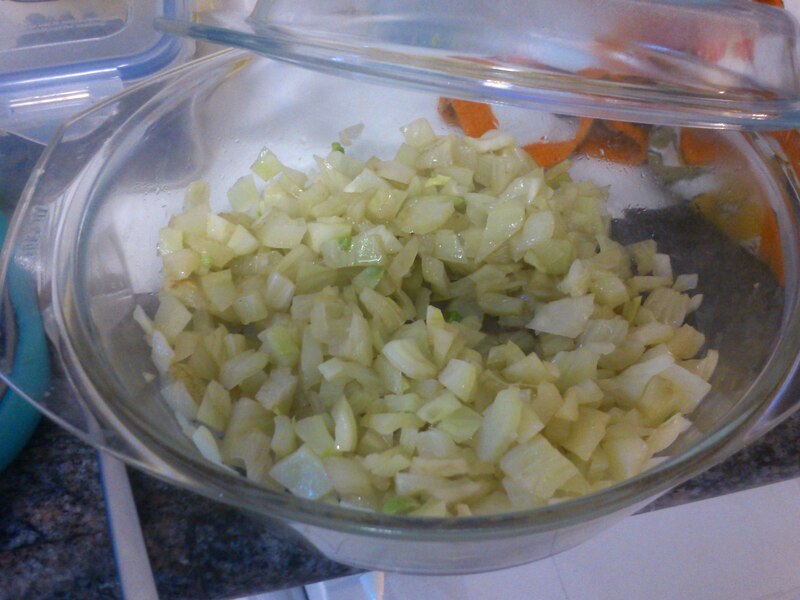 Blend the soup to smooth consistency (I used a “stick” blender to blend in the pot, it was so easy and quick). Make sure the soup is heated through and done! For serving, you can chop some spring onions and sprinkle on top for extra colour and taste. My guest liked it very much; my eldest did in fact taste it, but decided he didn’t like it. I am sure that if I make it more frequently though, he would like it. I loved it – it was creamy and comforting. I also discovered later that it freezes excellently. And it was absolutely delicious. Even though my baby will soon be one year old, I still have not returned to my pre-pregnancy weight. (Not that I know what it was, exactly – I’m going by my pants). So I decided to take a more active approach than “just trying to eat healthy”. I’m going to be eating cabbage soup for the next week. To implement (2) I started walking between baby’s daycare and toddler’s daycare when picking them up. My original idea was to walk from home, but I’m starting small, and that turned out good. Walking between baby’s daycare (let’s call it A) and toddler’s daycare (B) is roughly 5 minutes. Going back from B to A with toddler and stroller is a good 15-20 mins as it is all uphill. I get completely out of breath! It is better now than it was at the beginning… but not much. I do Pilates 1-2 days a week as well (have been for a few years now) but as they themselves say, Pilates alone is not enough as it is not aerobic. Well, after walking uphill for 10 minutes I can definitely testify to that! 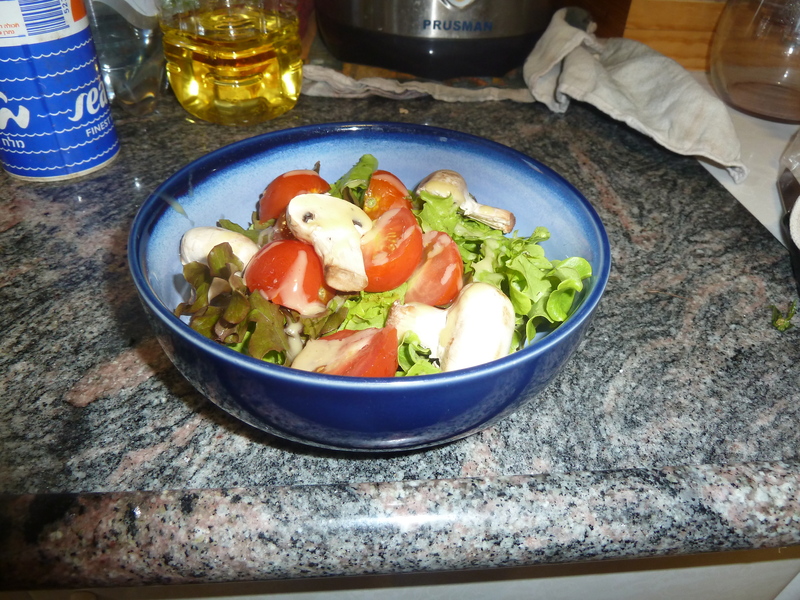 To implement (1), I try to add to each meal a salad or cooked vegetables. One of the things I’ve rediscovered is my love for green cabbage salads. This is also known as “Falafel” cabbage salad as this is the type of salad you can usually find at falafel stands. Easy and refreshing. The standard version has a lot more oil, but I don’t like mine so oily. You can put more or less vinegar to taste. We tasted this when staying Shabbat at my husband’s cousin. She made two types of cabbage salad, but I fell in love with this one. This is an impressive salad, good for company as well as when you feel like something special yourself. Mix everything except the last handful of almond slices. Just before serving, sprinkle almond slices on top.